A dog’s ear mainly has three parts, which appears as a canal. These are the external, middle and internal parts, which are distributed with different anatomical features. The outer and middle parts of the canine ear are specific for selection, collection and maintaining pitch of all sound waves which enters the ear. 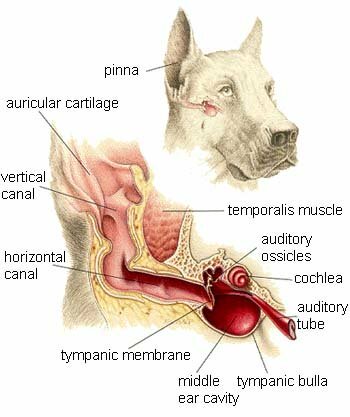 These parts of the ear canal have various angular curves; one of them is almost at a right angle, which helps a dog in assessing and maintaining the strength of sound at levels which are acceptable and safe for the inner parts of the ear. The middle ear ends with up to three different layers, which are collectively called ear drums. When sound waves hit these layers and the inner ear, which is the major functional part of a dog’s ear, the brain assesses and coordinates the identification of the sound wave. Moreover, associated anatomical bodies such as cartilages, nerves, vascular supply, glands and the ear cavity assists in the normal functioning of ear, and helps the body to maintain balance. The canine ear canal contains populations of microorganisms, including parasites, bacteria, fungus and some allergens. These agents grow in limited populations, with growth controlled by the dog ear wax. Once the ear canal is exposed to foreign allergens, microbes, stress or if it is not lubricated with an adequate amount of ear wax, different dog ear problems may develop. Similarly, if the immune system of the dog is suppressed or if the dog is experiencing any generalized illness, there is a chance that this will lead to increased microbial growth in the ear. The affects of different drugs, vaccines and repeated therapeutic therapies over the body may also cause health problems related to the canine ear canal. The ear canal itself is in fact a long tubular cavity which may develop different problems at different sites. Collectively, Dog ear symptoms such as a foul ear smell, head shaking, redness, dog ear scratching, lesions, inflammation, alopecia around the margins of the ear flaps (dog ear hair loss), ear discharge, partial or complete canine deafness and itching are some common symptoms related to ear canal problems. A dog with a problem in the ear canal may experience all of the above mentioned symptoms; veterinarians differentiate the problem based on the severity of different symptoms. Identification of any problem in a specific part of the ear canal can be done by studying the symptoms. When it comes to ear problems, dog owners can only examine or clean the outer part of the ear canal, The middle and inner part of ear can only be examined with the help of an instrument called an otoscope and other related equipment, which can only be found in a veterinarians office. If any abnormality or symptom is noted in the external part of the ear, it should be reported to a veterinarian. A detailed clinical examination and advanced culturing, isolation and/or histological procedures may be required to confirm the presence of a problem and to identify the specific problem. In some complicated cases, such as repeated dog ear infections, tumors and deafness, x-rays are considered to be mandatory before making a diagnosis. In order to treat any problem in the ear canal, specific drugs such as antibiotics, anti fungal drugs, anti parasitic, insecticides and some types of steroids are used; all of which should only be used with a prescription. Along with the specific treatment of any underlying cause, different approaches should be used such as the regular cleaning of the dog's ear with either a commercial or home made ear cleaning solution. Natural remedies such as Ear Dr. are proven to be very effective in the prevention and control of dog ear canal problems if used regularly along with ear cleaning. Along with topical natural remedies, it is highly recommended that dogs should receive other preparations as well such as Immunity & Liver Support Formula , which are used for boosting the immune system and the overall health status of your pet. These will surely help to reduce the chance of extensive microbial growth which is purely related to the immune status of your dog.